These plastic sweep kits are available for the following glass thicknesses: 1/4",1/2",3/8" -- and the following shower door configurations: Single, 90 Degree, 180 Degree shower doors. Giving your shower door a clean look and keeping the water inside of your shower. Clear Color Polycarbonate. Sweeps can be purchased individually or in kits. 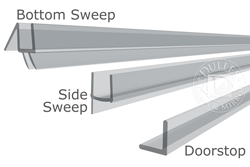 What is a shower door sweep and do I need one for my shower door? A shower door sweep is a clear polycarbonate and vinyl strip that snaps on the bottom of your shower door. 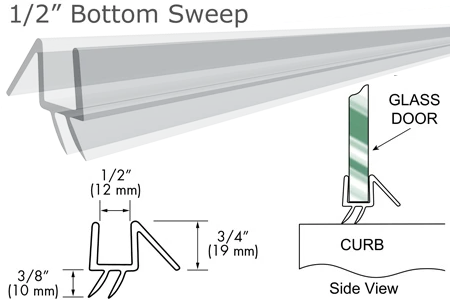 Some shower door sweeps come with an additional drip rail, which creates a water resistant seal and sheds water back into the shower. 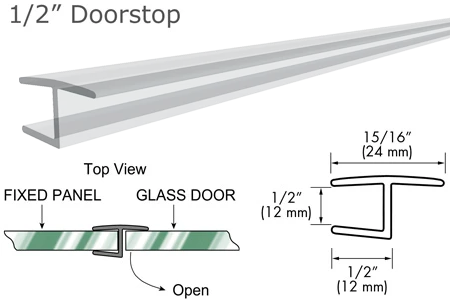 When your frameless shower door is installed, we leave clearance space between the bottom of the door and the floor so that the glass door can swing open without scraping tile. The plastic shower door sweep prevents water from leaking through that clearance space. 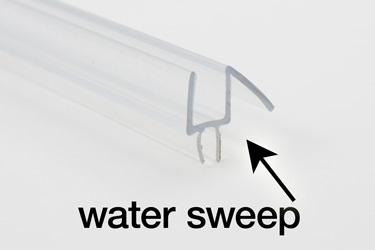 Sometimes, this sweep is called a "water wipe". 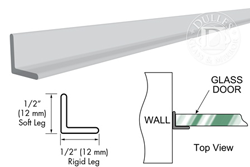 Can you design a shower door that doesn't leak? With proper design and installation, frameless showers should not have problems with water leakage, but they are not 100 percent watertight. There are many ways to prevent water leakage around a frameless shower door. 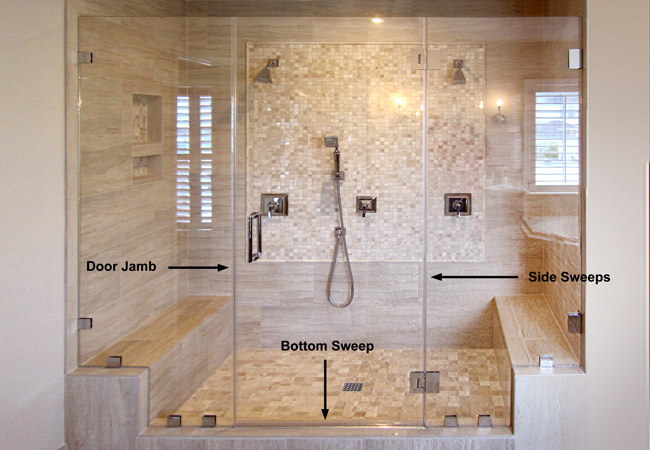 When we install your shower enclosure, here are some steps we’ll take to minimize the chance of leakage. 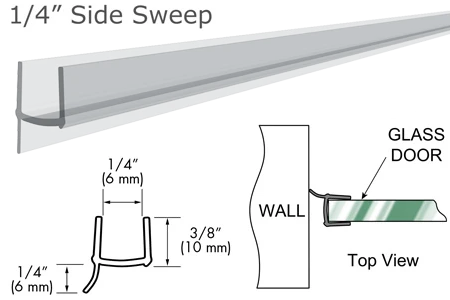 We will install a shower sweep with a drip rail onto the bottom of your frameless glass shower door. This will tighten up the clearance space under the door and prevent water from escaping the shower. We may add a back sweep to the rear of the door. It's a clear vinyl seal mounted with hi-bond tape. In some cases we'll use a doorstop. Our clear polycarbonate doorstops fit over the edge of an adjacent glass panel and have a lip that extends out to catch the frameless shower door preventing it from swinging into the shower. By catching the door, this jam temporarily closes clearance space along the door opening. We automatically seal door hinges to give them a protective property as well, but the hinges aren't waterproof. When your shower is being designed, make sure water does not spray directly at the frameless shower door. Your protective seals improve water tightness, but a glass shower isn't an aquarium. Over time, sweeps and stops may need replacing just like your car's windshield wipers. If your frameless glass shower suddenly seems less watertight, check your sweeps. 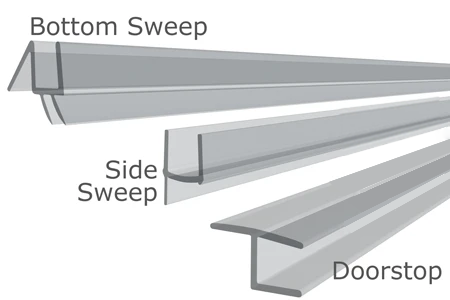 You should replace the sweeps when they get too dirty or lose their sealing properties. 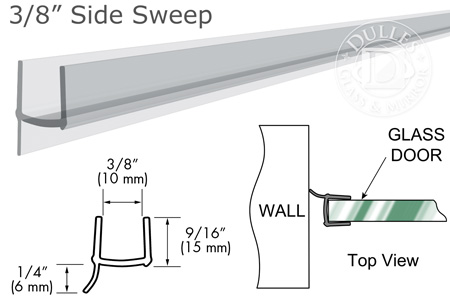 If you are cleaning your sweeps and notice they are brittle, it’s time to replace them. Generally, this occurs between 1 and 3 years after installation. When and how do I replace the vinyl seal and water sweep on my frameless shower? Sweeps are very easy to replace. 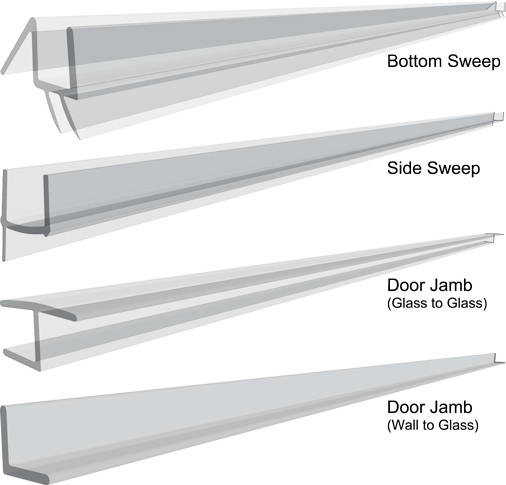 Simply order them from our online store and install them on your own. They snap off the glass and new ones snap easily on. How do I clean my bottom shower sweep and the side vinyl seal around my frameless shower door? 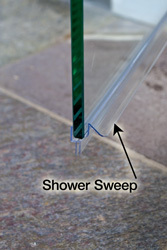 Clean your shower sweeps when you are cleaning the glass in your shower. If you find these are in need of extra cleaning, snap them off and use a cloth with warm water and a little bleach. Dry your shower sweep and vinyl seal, then just snap them back on again. Please don’t use harsh cleaners on your sweeps, particularly those that are not recommended for glass or hardware. This could cause failure of the plastic sweeps.